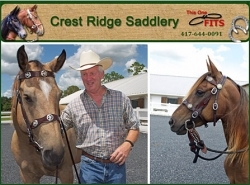 Crest Ridge Saddlery starts with expert saddle fitting to produce the best saddle, saddle pad and tack for your horse or mule. Our approach is the same regardless if you are riding a gaited horse, stock horse, draft horse or mule. You form a unique combination with your equine. Each saddle is built to order using your measurements.